Rugged and ready to play, this sporty Wrangler X carries a clean CARFAX and is dressed to the nines with oversized tires, lift kit, and tons of custom accessories sure to turn heads on and off the beaten path! Twist the key and fire up the stout 3.8l OHV V6 producing 202hp and 240lb-ft of torque for strong off-the-line acceleration matched with strong freeway cruising ability as well. Paired with a slick-shifting 6-speed manual gearbox, this Wrangler is not only a blast to drive, but returns 21MPG highway as well. Command-Trac part-time 4-wheel drive features hi- and lo-range modes via an easy-to-use manual transfer case to make quick work out of even the most challenging terrain. A tow package lets you carry along up to 1500lbs of trailer with you. Ready to load up for your next adventure? So is this Jeep! A wide-opening swing-gate lets you take along all your gear and belongings while a folding/removable rear bench offers even more space. With rear seat in place, four ride on durable cloth upholstery in a cabin featuring easy-entry seatbacks for quick access to and from the rear. Up front, dual buckets feature dual recliners along with a driver's height adjuster and center console. A host of features include ice-cold A/C, a 6-speaker AM/FM/CD stereo w/Pioneer touchscreen headunit featuring Bluetooth, navigation, and AUX input jack, power windows, power door locks, remote keyless entry, cruise control, driver info center, leather-wrapped tilt wheel, variable-speed wipers, and more! Safety is ensured with 4-wheel antilock disc brakes w/panic assist, dual front-impact airbags, traction control, and stability control. A host of eye-catching upgrades include custom 17" Pacer black billet alloys wrapped with 35" A/Ts, a 4" lift kit, custom metal front bumper w/integrated LED foglamps, LED headlamps, mesh grille, tubular steprails, LED taillamps, and slant-back soft-top. Ready to go!----Call or text Brian at 727-226-3097 for more info, photos, or to schedule a test drive today! 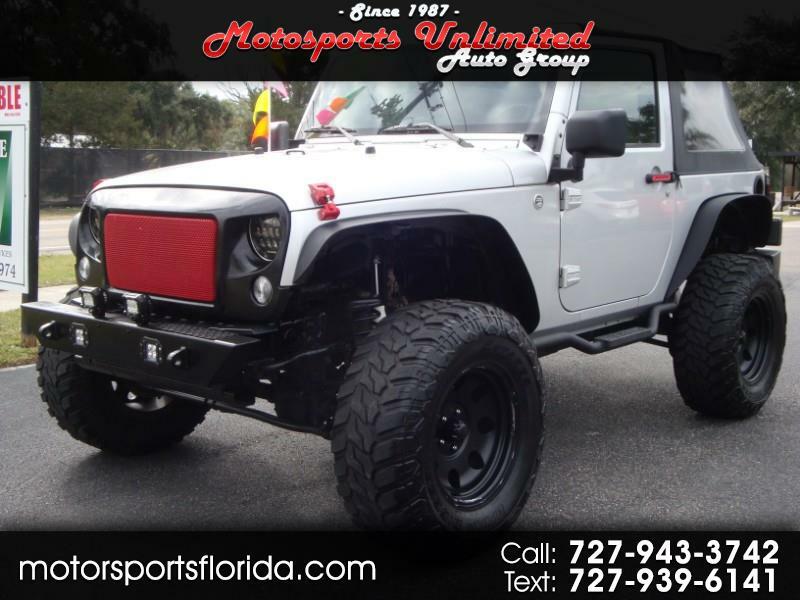 Visit MOTORSPORTS AUTO GROUP online at motorsportsflorida.com to see more pictures of this vehicle or call us at 727-943-3742 today to schedule your test drive.